The Intelligence Officer assured Gibson that she was well able to keep secrets. Gibson probed further, checking his understanding that Gillon was married and that her husband was overseas. Gillon surmised that the reason for these questions was that as a married woman she would be unlikely to have boy-friends with whom she might talk about squadron matters. Richard Morris, Guy Gibson, Penguin 1995, p146. Gibson went on to give her the important task of liaising with 5 Group headquarters over the routes for the training programme, and installed her in an office next to the squadron Navigation Officer, Jack Leggo. Gillon became good friends with Leggo, his skipper Mick Martin, and the rest of his crew, and she flew with them on the final dress rehearsal on the Friday before the raid. Her full account of this trip was published in Morris’s book, as mentioned above, pp160-2. The next day, Saturday 15 May 1943, she was again looking over Martin’s aircraft after its Upkeep mine had been loaded. She may have inadvertently pressed a cockpit lever which dropped it from the aircraft onto the hard standing below. Everyone scattered as quickly as possible, but fortunately the mine didn’t explode. Fay Gillon died on 5 November 2009 and her wartime photograph album now belongs to her granddaughter, Carissa Howard. Last year, she allowed Australian writer Ian Andrew to publish some of the pictures it contains on his blog. The images provide a further insight into life at Scampton in the spring and summer of 1943. One of the most interesting informal shots shows a group of officers and some civilians, probably taken outside the officers mess. Gillon was one of the WAAF officers who accompanied the 617 Squadron contingent by train to London for the investiture at Buckingham Palace. Although she is not named in adjutant Harry Humphries’s account of the riotous railway journey, she is likely to have been a witness to the incident when a drunk and trouserless Brian Goodale was pushed into the compartment in which she was travelling. Humphries had to remove Goodale hurriedly as there were “ladies present” whose modesty had to be protected at all costs. She attended the investiture and the album includes some photographs taken there, including one of the Australians who were in attendance. By September 1943, 617 Squadron had moved out of Scampton to Coningsby. However, by then her WAAF colleague Ann Fowler had become engaged to David Shannon and Gillon attended their wedding. After the war, Fay Gillon and her husband Peter moved to France and started their family of four children. They later lived in London and then moved to Perth, Australia, in 1980. She returned to the UK on a number of occasions, and was very helpful to a number of people researching the history of 617 Squadron, including myself. Thanks to Carissa Howard for help with this article. Great photos. Do you know which squadron Fay Gillon was based at before she went to 617? May give a clue as to the airmen in the photo with her. Thanks for these wonderful pix and the interesting story, just love this blog. Very very interesting – thank you for sharing. Wow…very very interesting. Thanks for posting this piece of history. Much appreciated. 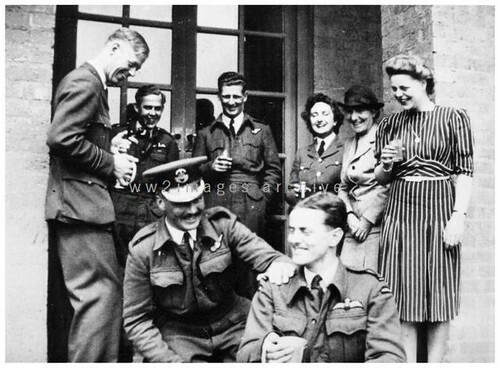 I remember seeing two photographs some time ago of Mick Martin, Jack Leggo and Bob Hay together with some other officers, Fay Gillon, an other WAAF and the mother of either Fay Gillon or the WAAF. They were standing in front of the mess, Mick Martin held a cup (of tea?) in his hand. 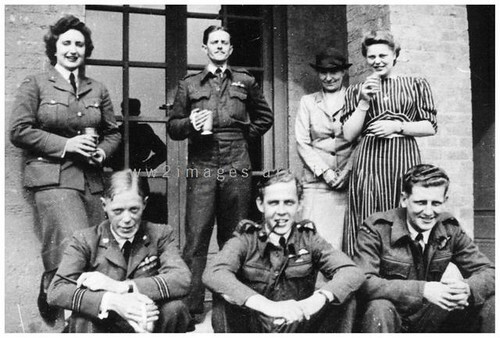 The picture was taken during Martins time at 50 squadron, so Fay Gillon must already have met the Martin crew before her 617-time. So the crew in the picture is probably also a 50-squadron crew. Unfortunately I can’t find the pictures anymore on the web. Having studied, modelled and painted anything Dambuster-related for the past 40-odd years, I was most interested when I came across this blog only a matter of weeks ago. What a truly inspiring site this is, so full of very interesting information! I had the pleasure of speaking to Len Sumpter some 30 years ago, when I wanted some info for a painting of his Lanc. I simply saw an ‘L.Sumpter’ in the national phonebook of the times and rung him! I remember him as a very friendly sort (especially to a total stranger! ), and he even apologised for his breathlessness after spending some time on his defibulator(?) in his armchair! I got the info, in his Sheffield(?) burr I required for my painting as well as his explanation of his use of chinagraph crayon lines marked on his viewing blister for bomb release uses instead of the famous wooden Dann sight! He was indeed a true gentleman. Many thanks once again for producing this magnificent site. Thank you so much for posting this. My grandfather was Thom Simpson, and I remembered seeing that group photo he was in ages ago but nobody in the family seems to know where it is anymore. I had been searchinh the internet for a while to find it. Great work with your site! I’ve found the pictures I’ve mentioned in my previous post of April 5th, 2016. They were taken on February 19th, 1942. But I think I was wrong. Here the woman is mentioned as Fay Gillam instead of Fay Gillon, although she does look pretty much the same! If she is the same, than the Martin crew already knew Fay Gillon more than a year before the dams raid.